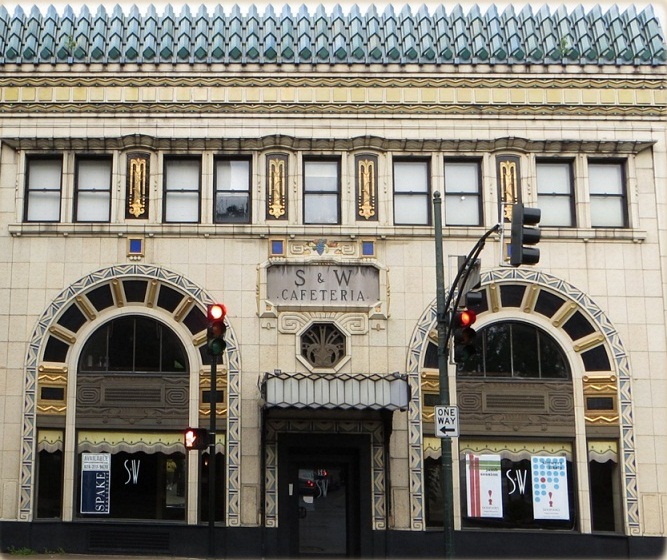 Asheville has the largest collection (more than 65) of art deco buildings outside of Miami. And it’s not an overstatement to say that they’re dazzing. Combine that with its other dazzling feature — its mountain setting — and you’ll never want to go inside. Asheville understands that. So it’s turned three things it does well – art, history, and the outdoors – into what it calls a “museum without walls.” The Asheville Urban Trail is a 1.7 mile route that walks you around downtown Asheville. 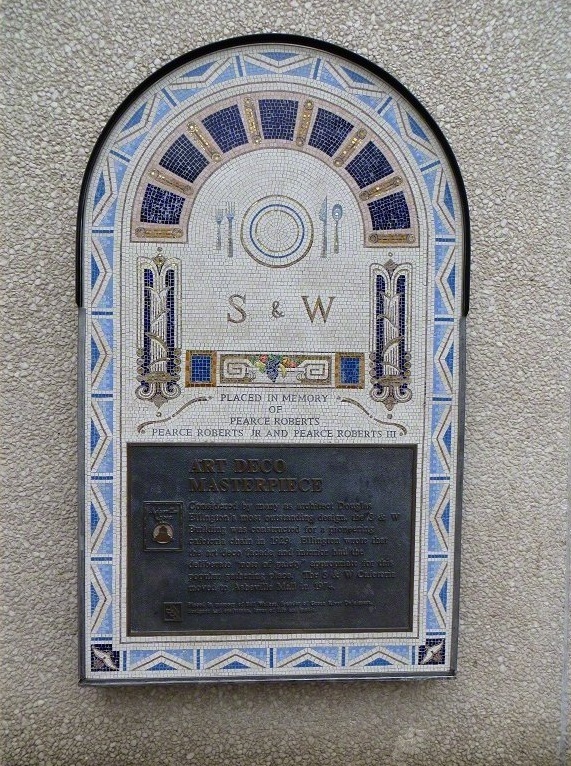 And along the route are 30 stations — a combination of art object, each created by a different artist, with explanatory bronze plaque — that tell the story of people or events that shaped Asheville’s development. We took the Urban Trail to learn about all of Asheville’s history, but ended up being drawn in by it’s Jazz Age associations. If F. Scott and Zelda Fitzgerald thought that Asheville was the place to be in the 30s, who am I to argue. Asheville lies in the middle of the Cherokee Nation. Its first permanent white settlers came in the late 1700s but major growth didn’t happen until the 1880s, when the railway came to Asheville, allowing for a rise in industry and population. In the 1870s, a local doctor specializing in the treatment of tuberculosis began advertising Asheville as a health retreat. It caught on. One health tourist was Edwin Wiley Grove, who eventually became one of Asheville’s foremost real estate developers. The gothic revival Grove Arcade, the first indoor shopping mall built in the U.S, was opened in 1929 by Grove, who had made his millions selling an anti-malerial quinine tonic. Grove died before the arcade was completed, but it’s glass Urban Trail station has an etching of the tower that was part of Mr. Grove’s original concept. The government appropriated the arcade during WWII and used it to house the National Climatic Data Center (NCDC) until the 1990s. The NCDC is still in Asheville, in another building, and the Grove Arcade is now filled with restaurants, shops, nongovernment offices, and condos. 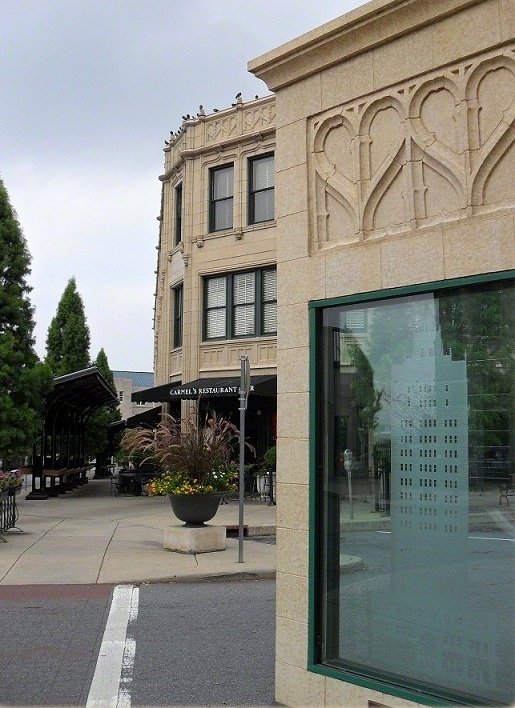 The Urban Trail station above celebrates art deco architecture in Asheville. It features a Venetian mosaic that mirrors the 1929 S&W cafeteria building below, designed by North Carolina native Douglas Ellington. The Asheville cafeteria, one of a chain scattered throughout the southeast, opened in 1929 and was a popular gathering site until it closed in the 1970s. Now, a there are condos upstairs, while downstairs is retail space, currently empty. Douglas Ellington also designed the art deco Asheville City Hall. Asheville became internationally famous as a result of the publication “Look Homeward Angel,” by a native son, Thomas Wolfe. Published in 1929, the book is a fictionalized account of Wolfe’s childhood in Asheville. It is not a flattering portrayal and his contemporaries in Asheville hated it. Asheville seems to have forgiven him and the local Wolfe tourist trade is huge. Wolfe introduced his friend, F. Scott Fitzgerald, to Asheville and in the 1930s, Fitzgerald moved himself into the Grove Park Inn and his wife Zelda into the Highland mental hospital, both in Asheville. Fitzgerald apparently was a rowdy drunk and the Grove Park Inn wasn’t thrilled with his presence. Like the citizens of Asheville, however, the Inn has a forgiving nature. Fitzgerald’s portrait hangs prominently in the Inn, and his name is all over its advertisements. Zelda died in a fire at Highland. You can get a printed self-guided tour map of the Urban Trail from any Asheville tourist center, or download it and a podcast of the tour from the Asheville Parks and Recreation website. The brochure accompanying the map just repeats what’s written on the bronze plaques at each station, which are not particularly illuminating or interesting. The podcast does an infinitely better job of providing an informative narrative. The tour officially starts at Pack Square , but you really can pick it up anywhere along the trail. My favorite place to stay in Asheville is the Hotel Indigo. Its staff is friendly, its decor is sleek and modern, and it’s location is prime. The Grove Arcade is one block away and the hotel is within walking distance of almost anywhere downtown. My favorite restaurants are both boho fun: the farm-to-table southern comfort food Early Girl Eatery and the vegetarian Laughing Seed Cafe, both on tiny Wall Street downtown. Gallery | This entry was posted in North Carolina and tagged Asheville, history, hotel, public art, restaurant, travel. Bookmark the permalink. Art deco is fascinating. Such striking art, and the architectural facades are brilliant. I love art deco. Porbably my favorite artistic style. i was wondering what happened to the etched glass engraving of the Grove Arcade, that was on the corner of Page, and Battery Park. it was a wonderful glass piece. The glass etching of the original design of the Grove Arcade is gone? I haven’t been to Asheville for several years, so I didn’t know. It was a beautiful art deco piece. I’m going to have to try to hunt it down.